Easter is early this year, not as early as it can be, but it’s in March instead of April so that makes it early in my book. I’m hoping we have sunny, warm weather. March came in rather not-nice this year so hopefully it will go out nice. 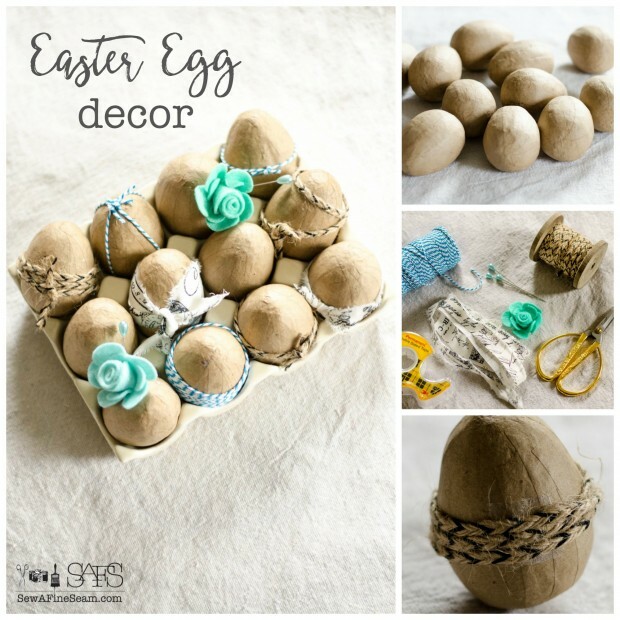 Today I have some Easter Egg Decor to share with you. 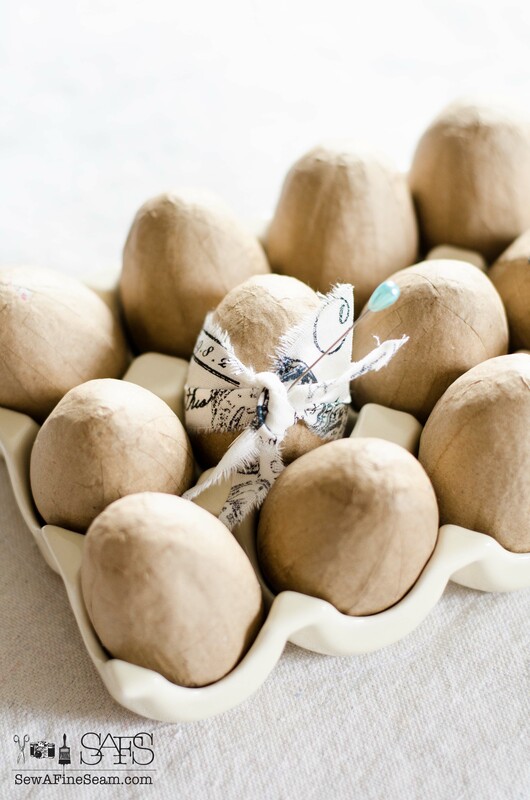 My friends and I decided on Easter Eggs for our Dose of DIY this month and when I saw a pack of paper mache Easter Eggs half price recently I nabbed them. I had some lofty ideas for some elaborate ways to bling them out – involving textiles, glass glitter, mod podge, paper, hot glue, and they were going to be epic. But really, you know I don’t do epic lately. I barely get any crafty stuff DONE lately for the blog – have you noticed my posts have been few and far between? Or perhaps you are like me and so busy you never really noticed. Anyway. 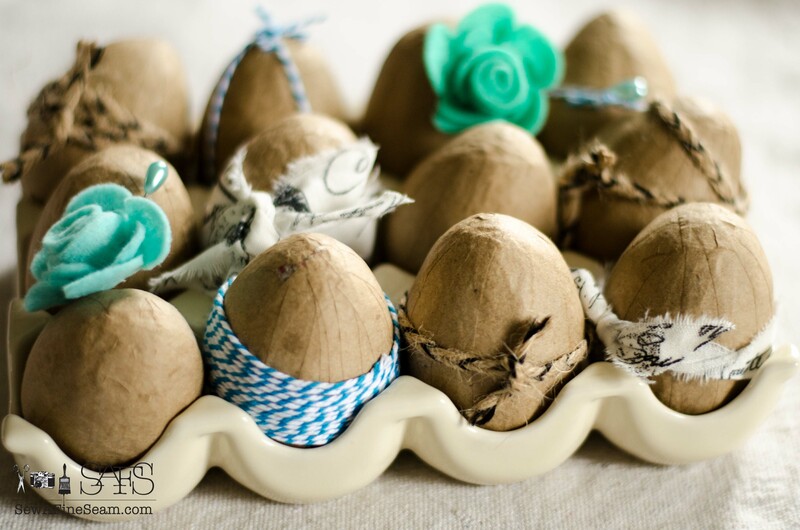 Epic didn’t happen but I did come up with a fun way to bling out these paper mache eggs that is easy, fast and really quite beautiful. 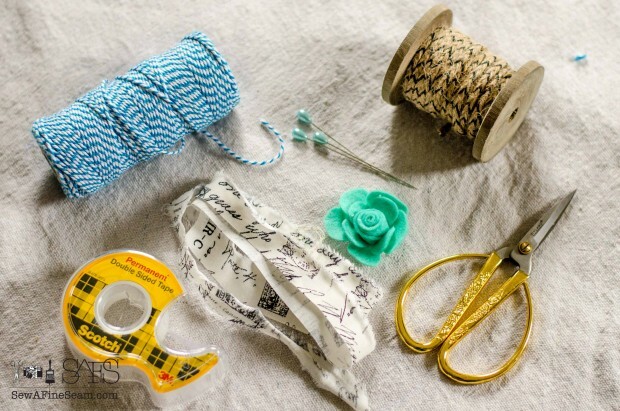 All you need is to pull out some things you have on hand and you can make them pretty in a hurry. Although I must insert here that I really kind of like them just plain brown too. Totally works if you don’t even have time for these simple updates I managed. First I simply tied my fabric ‘ribbon’ around a couple eggs. The corsage pin added here was purely for decor and isn’t needed to hold the ribbon in place. The corsage pins WERE used to hold the felt flowers in place – I simply pushed the pin through the backside of the flower and into the egg. Easy-peasy, no rocket science stuff going on here! 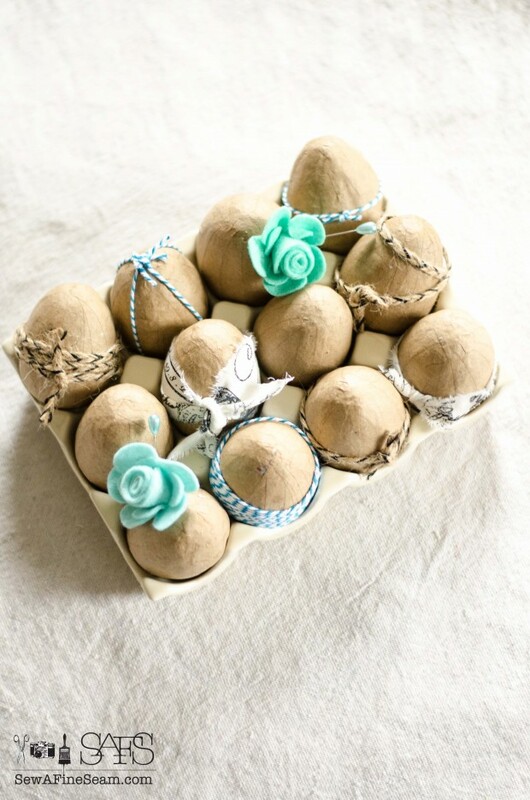 Because the eggs are, of course, egg-shaped, the twine and ribbon wanted to slip off when wrapped around the eggs with nothing to hold them on. 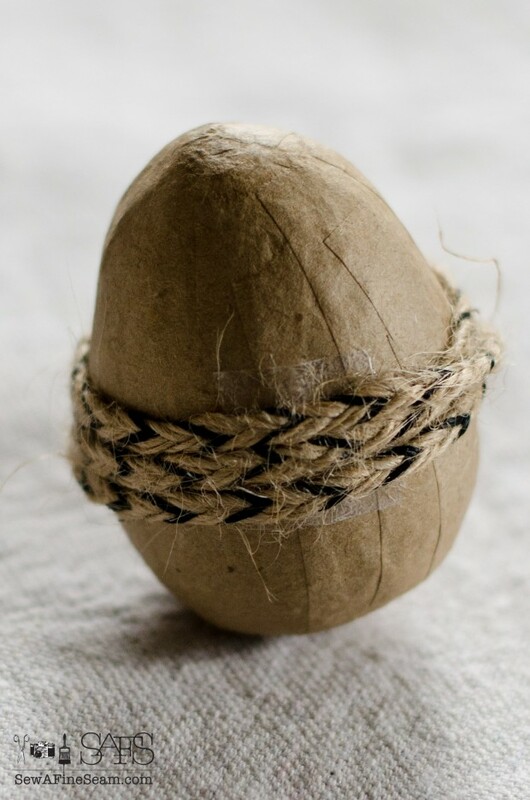 I used double sided tape to secure the twine to one side of the egg as I wrapped. It works and can be easily removed if I want to use the eggs again in a different decor scheme or color. 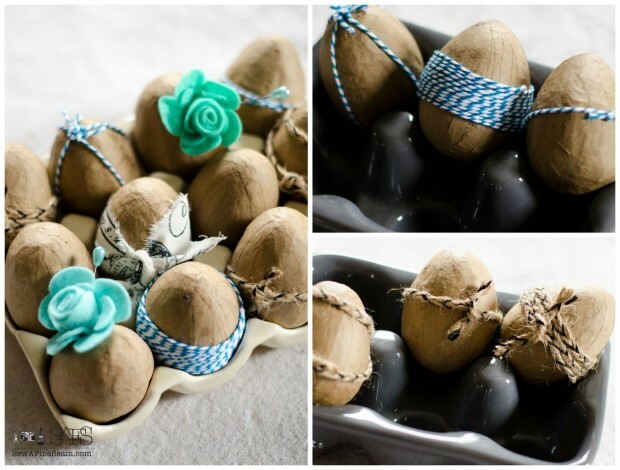 I did different formations around the eggs with the twine and ribbon. 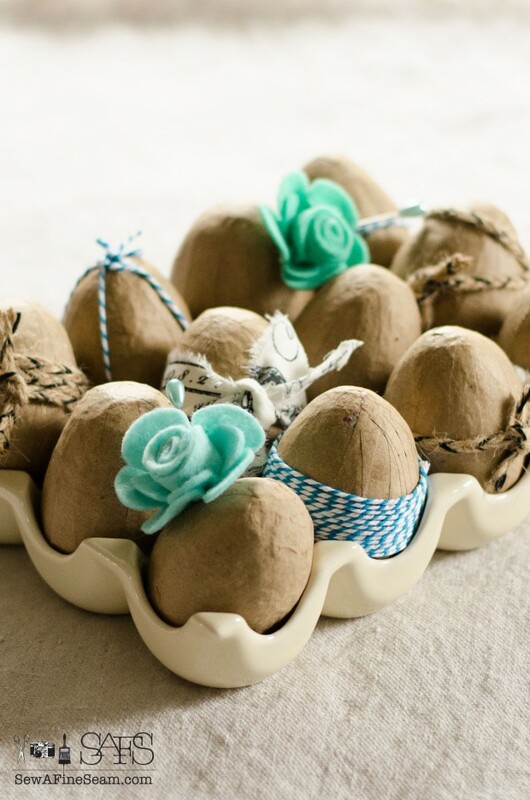 You could mix it up even more and use different ribbon colors and textures on each egg. I left some of the eggs unadorned because I liked the look. 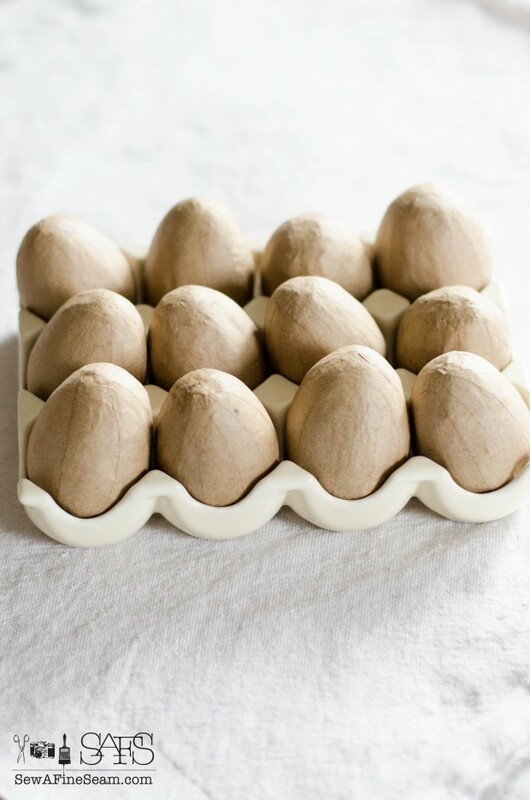 I love the way they look in this egg holder – I honestly can’t remember where I got this – decor steals perhaps? Simple and lovely in their simplicity these undecorated eggs would look sweet in an Easter vignette. Bling them up a bit for more glam and sophistication if you want! It only took me about 15 minutes to detail and photograph these so I promise it is super easy and fast! 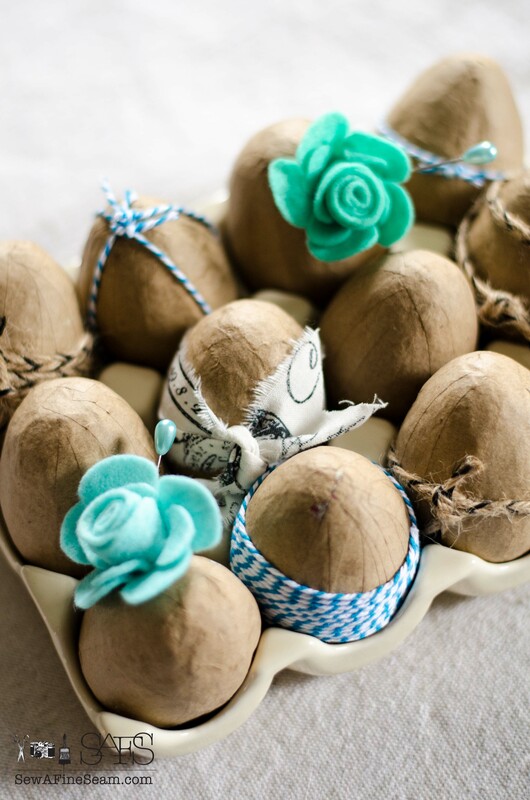 Make sure you go check out what my friends did for Easter Egg Decor! 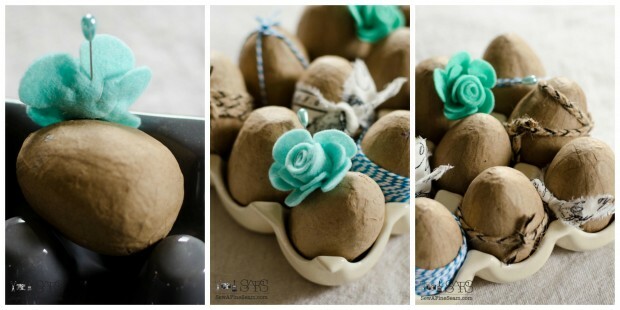 Jill you always come up with the cutest ideas LOVE these! Thank you Tammy! They were so simple and easy but I really liked the way they turned out! those are so sweet. i love the details. I’m an Ohio girl myself but live in AZ now. but I visit there often. Enjoy your lovely spring-like weather! Thanks Tamara, I wish every winter I could vacation in Arizona or Southern Texas where it’s warm! Thanks Colleen – I like the ‘carton’ pretty well too! 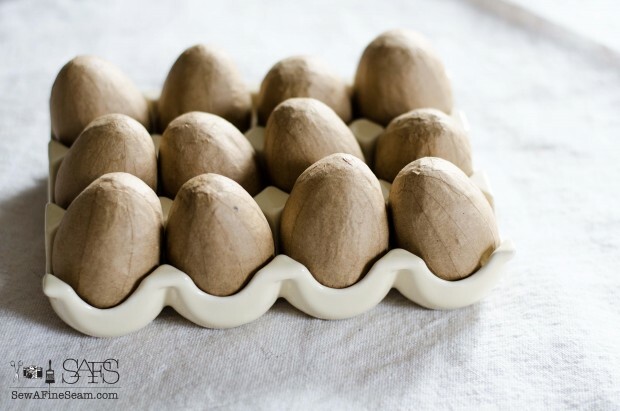 I like the egg holder too Kathleen and I’m really glad I bought it – it’s just fun to use for decor and I think I could use it to serve deviled eggs too even thought its not really shaped the right way I think I could make it work.